Potentiometer and Rheostat are two terms that are associated with the variable resistors. Technically both these terms represent the two different configurations provided by the same components. After reading this post you'll be able to develop a crystal clear concept regarding both terms. A variable resistor is a three terminal device. It provides a variable value of resistance across electrical circuits. For example, a 9 kΩ V.R will provide resistance ranging between 0-9k. The most common type of V.R is shown below. It has three terminals a, b, c (We will drive in the details later on). 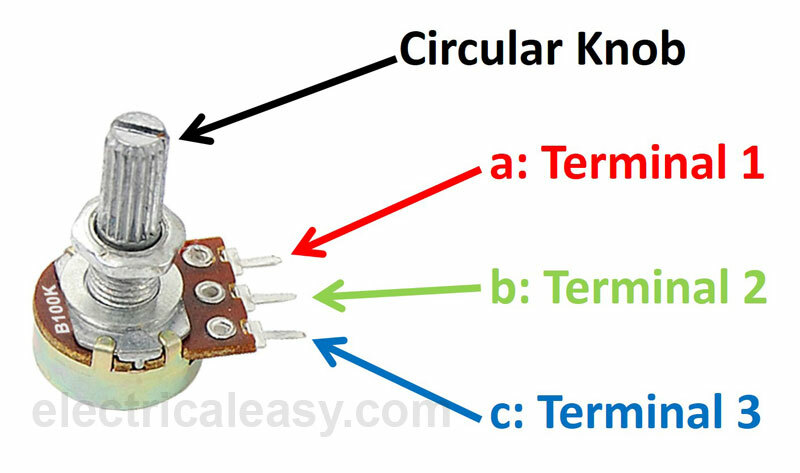 The circular knob can be rotated to achieve variation in output resistance. As previously mentioned the above type of variable resistor is most common. Meanwhile, it is the oldest one too. Today's variable resistors are packaged as trimpots (the latest version) with a small bolt on one side. A screw tightener can be used with trimpots for operations. Let's reconsider the original variable resistor. The potentiometer configuration utilizes all the three terminals in working. The left side of image displays the circuit diagram for config and right side displays the practical look. Two blue wires connect to an external circuit for providing a variable voltage to the output. And that is the reason why potentiometer is named so. This arrangement employs two terminals of a variable resistor in its working. Terminal a connects with the power source, b connects in series with the external circuit and c is left open. The purpose is to achieve a constant value of 'R' so as to achieve a variable current in the connect circuit/device. The left side of image displays the circuit diagram for Rheostat configuration and the right side provides a practical connection for this config. A potentiometer provides variance in voltage at output terminals and is employed in Power industry for controlling the speed of DC Machines. It also finds its application in sound equipment for controlling the audio. The frequency matching on old radio sets utilised repeated principles of both these configurations. The potentiometer and rheostat are the two configurations that can be used in electronic circuits and components to achieve a variable voltage and current values. Author: Guzel Sans completed his bachelor in Power Electrical Engineering. His areas of interest are HF Modelling, Power Systems Protection, and Electronics design Engineering. He loves Programming JS, CSS and playing with HTML5 in leisure hours. He is the founder of online tool Electrical Calculators. Favourite software: MATLAB.